Looking for the perfect gift for a special man in your life? Make him this warm and cozy scarf. 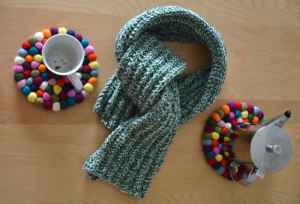 This scarf looks fancy but is actually very easy. Just a little variation on a simple ribbed scarf. The seed rib stitch I used allows for wider ribs that will not close up.